After a blank year in 1989, Newcastle decided to have another try in 1990. 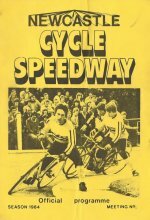 Mainstays, Andy Murray and Brian Mills had retired, and Paul Marshall was only to ride in home meetings, but the Parrs, Keith, Kirkup,and Wilson returned from a season with Hull. There was an injection of new talent as a group from the Durham area with little experience were keen to make their mark. Brothers Andy and Paul Dickinson, Neil Magee and Kristian Walker were all to figure in both leagues. Teams consist of 8 riders. Numbers 1-6 have 5 programmed rides. 6 and 7 are reserves who have 3 programmed rides, However they can replace riders in the main side up to a maximum of 5 rides. This division is used mainly to bring on the less experienced riders. For many reasons it is necessary to use riders from the the Division 1 match. In these cases a rider(s) is penalised by the number of points, including bonuses and missed rides gained in the first match. Teams consist of 6 riders who have 4 rides each, the final heat is a nominated one, so a rider can have a maximum of 5 rides. Two extra riders can be named at 7 and 8, they have no programmed rides, but can replace a team man. Penalty points and riders are shown in red. Maximums are underlined. Newcastle's first league match was a tough one, away to Manchester. It was a decent display led again by Mick and Gavin Parr. Jason Keith was unbeaten in his three rides at reserve, and it was a surprise he had no more rides. Manchester were solid throughout with veteran Derek Garnett leading the way with a paid 19. D Garnett 18+1, S Davidson 16+2, L Phillips 13+3, G Garnett 12, J Higham 11+1, L Bowden 10+1(4), M Hack 9+2(4), D Kilroy 8+1(3). In Division 2, a new look Newcastle side gained a runaway win on track, and even giving up 25 penalty points gave a great display. Newcomers Neil Magee, Kristian Walker, Andy and Paul Dickinson all scored freely, giving hope for the future. D Kilroy 15, G Hollingsworth 14, G Spence 8, A Crolla 6 (5), J Cawley 5 (5), D Ridley 4. N Magee 18+1(5), K Walker 14+1(5), J Wilson 14+1, A Dickinson 13+1, A Patterson 10+3, P Dickinson 9+3. The first home meeting saw Sowerby Bridge visiting, but it was not a happy meeting for the Yorkshire side. Fred Rothwell after two good rides crashed out in his third, and his day was over. Jemson and Mann from reserve did well, but Newcastle dominated with Gavin Parr and a returning Paul Marshall unbeaten. 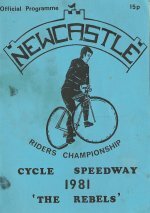 Newcastle won 12 heats in their 39 point victory. G Parr 19+1, P Marshall 19+1, M Parr 17+2, J Wilson 14+3, T Kirkup 13+2, J Keith 12+2, N Magee 7(3), A Dickinson 6. P Dyson 13, N Jemson 12+2(6) ,R Machin 12, P Mann10+2(4), F Rothwell 7(3), D Elam 7, A Cigan 4(4), J Parker (3). A very rare event occurred in the Division 2 match. 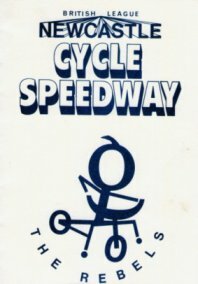 A young Sowerby Bridge side went under the cosh and lost 12 of the 13 heats by the maximum 7-3.Only respite was when Kristian Walker fell in heat 10, preventing a total whitewash. A Dickinson 16, N Magee 16, P Dickinson 15+5(5), K Walker 15+1(5), A Patterson 14+2, N Carson 12+4. I Johnson 10(5), J Brealey 7, A Cigan 7, M Jones 7(5), S Rothwell 5+1, W Cavil 5. The long journey to Birmingham resulted in two big wins for Newcastle. Gavin Parr headed the scoresheet again with a full maximum, and was well supported by the rest as Newcastle won by 20 points. P Widdas 13+2, M Winwood 13+1, B Prince 13, A James 12, D Bullock 11+1, M Lander 9+2, C Plummer 6(4) Lander 2(2). G Parr 20, M Parr 18, J Wilson 16, T Kirkup 14+3, J Keith 11+1, N Magee 10, A Dickinson 5+1(3), P Dickinson 5(3). The Combination side had another blockbuster meeting with the top five unbeaten. Only debutant Graeme Turnbull missed out, but even he had a paid win in his first ride. R Malkin 11, S Hull 9, C Winwood 7+2,R Benning 4(3), P Jackson 4+1(3), M Ellman 4(3), S Addis 2(2), R Pilling 2(2). K Walker 19+1(5), N Magee 18+2(5), A Dickinson 16, P Dickinson 13+3, A Patterson 13+3, G Turnbull 6+1. Following their win in the Midlands, Newcastle faced the difficult task posed by strong Manchester side, Tameside. The visitors took the lead in heat 2 with a 7-3, and went further ahead with another maximum in heat 8. Newcastle kept it tight for the rest of the meeting, but Tameside finished 11 points to the good. Mick Parr had another great meeting dropping his only point to maximum man Roger Farrell. Inexperience at reserve contributed to the defeat as they were outscored 19 to 7. M Parr 19, J Wilson 13+1, P Marshall 12+1, G Parr 12, T Kirkup 10+2, J Keith 10, N Magee 4(3), A Dickinson 3. R Farrell 19+1, S Pearce 13+1, Jason Burke 13+1, B Eaton 11+4, M Mulvey 11+2, G Dent 10(3), A Ratcliffe 9, A Chadwick 8+3. In Division 2, Tameside used three first team riders, forfeiting 30 penalty points, they did win the meeting on track by 10 points, but Newcastle took the league points by 13 in spite of the fact they took the flag only three times, but packed the minor places. Dent and Mulvey were unbeaten for Tameside. N Magee 13, A Dickinson 12, K Walker 10+4(5), P Dickinson 10+2(5), A Patterson 10, N Carson 5+1. G Dent 19+1(5), M Mulvey 14+2, A Radcliffe 13+1, A Smith 13+1, G Farrell 6, I Graham 5. Another Sunday, another Manchester team, another home defeat. It was very nearly a repeat score as well, Newcastle scoring one more point. Stockport took the points, with Terry Norman unbeaten as well as no.8 John Burke who won his four rides. For once Mick Parr had a poor meeting, and pulled out of the meeting. It was to be his last meeting for Newcastle. Heading the home score chart was Gavin Parr with a paid 18, again Newcastle struggled at reserve. G Parr 17+1, J Wilson 16, P Marshall 13+3, T Kirkup 12+1, M Parr 9, J Keith 8+1, N Magee 5+1, A Dickinson 4. T Norman 19+1, John Burke 16(4), M Williams 14, G Johnson 13, A Jackson12+2, F Finnigan 9+2, D Morgan 6+1(3), B Wheatley 6+1(4). In Division 2 Stockport to their credit rode six different riders, while Newcastle rode their two reserves giving away 10 points. Dean Carson (son of Norman) made his debut but had a hard time. Stockport won by 10 points on the track, again a repeat of the previous match, but won overall by 80-60. A Dickinson 14, N Magee 13, A Patterson 10, P Dickinson 9, K Walker 9(5), D Carson 5(5). D Craggs 15+1, C Davis 11+4, K Garland13, C Finnigan 13(5), T Day 11+1, C Davis 11+4(5), T Sharples 7. Newcastle were now in a weakened position, especially for away meetings. For the visit to Heckmondwike, only four first team riders were available, therefore it was no surprise the Rebels were defeated. What was surprising was how well the team performed, led by the unbeaten Parr a seventeen point defeat was quite acceptable. M Kent 19, S Blair 16+2, D Kent 16, S Carter 12+3, P Beacock 12+3, M Webster 12+2, M Richardson 6+1(3), D Smith 5+1(3). G Parr 20, J Keith 14, J Wilson 14, N Magee 9, A Dickinson 8, T Kirkup 7+2, N Carson 6(3), A Patterson 3. Steven Hunter and Steven Baxter made their Division 2 debuts as Heckmondwike took a narrow six point win on the track and twelve overall. Neil Magee continued his rapid improvement and was unbeaten, and had strong support from Kristian Walker and Ashie Patterson. D Keeton 15+1(5), D Smith 14, C Layden 12+4(5), D Wood 10, J Carter 9+3, M Cally 8+2. K Walker 17(5), N Magee 16, A Patterson 15, D Carson 5, S Hunter 5(5), S Baxter 4. Sheffield were the next visitors, and Newcastle took a welcome win if both meetings. Kristian Walker made his first team debut, and celebrated with a win in heat 15. Gavin Parr once again was unbeaten, with John Wilson backing up well. After five drawn heats, the home team took a 7-3 with Keith and Kirkup, and moved steadily held. Only one heat went to Sheffield, a 6-4 in heat 17. G Parr 20, J Wilson 16+2, J Keith 14+1, T Kirkup 13+2, P Marshall 13+1, N Magee 10+1, K Walker 6(3), N Carson 4(3). M Ashton 18, A Cumbers 13+1, P Ashton 12+2, S Perkingon 12, G Stringer 10+3, S Flanaghan 9+2, S Keyworth 5(3), R Mayo 4+1(3). 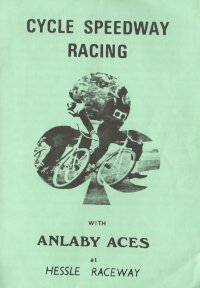 In Division 2, Sheffield gave away a massive 37 points, and although they won the meeting on the track, a strange looking Newcastle side eased to ana overall 7 point win. Guy Stobbart made his first appearance, as did Mick Hoult and his son Mark. Mick had ridden in the 1960s, and was instrumental in helping to revive the sport in 1978, Mayo was unbeaten for Sheffield. K Walker 16(5) A Patterson 12+1, Mick Hoult 8+1(5), D Carson 7, Mark Hoult 6, G Stobbart 5. S Keyworth 17(5), R Mayo 15+1, S Perkington 14+1, A Cumbers 13+1, S Marshall 12+5(5), Matt Ashton 5. 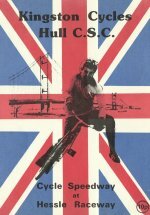 17 June 1990 HULL v NEWCASTLE British League North Division 1 Won 92-87. 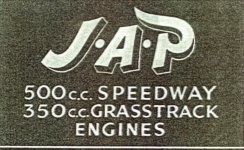 Hull were destined to finish bottom the league, but the Rebels weren't to know this they arrived at the Hessle Raceway without John Wilson. A close match took place with eleven races shared, and 6-4s were traded, neither side managed a 7-3. Newcastle had their noses in front by heat 4 and did enough to eventually win by just five points. Hull's top six all got into double figures, but had no answer to Gavin Parr with another 20 point haul. Jason Keith dropped just two points, while Neil Magee kept up his excellent form. P Schofield 17, A Schofield 15+1, B Ashton 13+2, C Boot 13+2, R Pawson 12+3, A Craven 10, A Norrie 6+1(4), L Smith 2(2). G Parr 20, J Keith 18, T Kirkup 17+1, N Magee 11, A Dickinson 9, K Walker 8+2(4), A Patterson 7, N Carson 2(2). 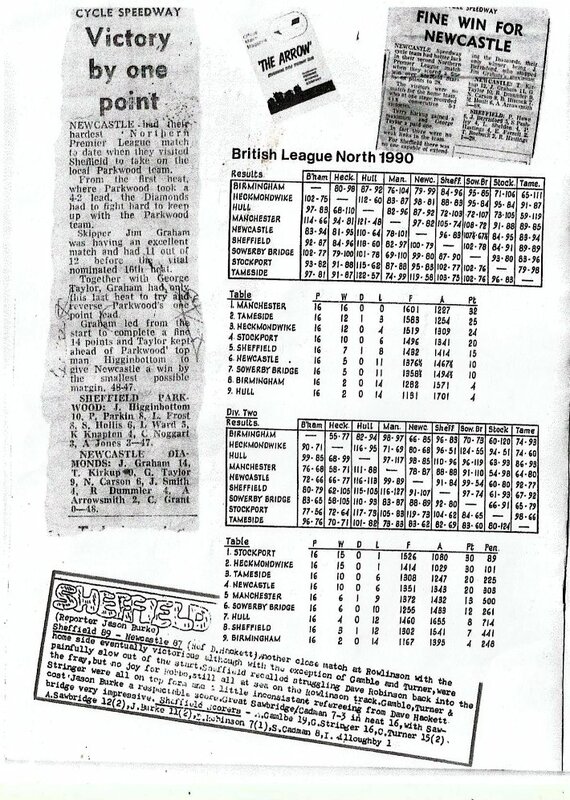 17 June 1990 HULL v NEWCASTLE British League North Division 2 Lost 65+20=85 - 65+33=98. Newcastle forfeited 33 penalty points in Division 2 and Hull 20, giving the home team a distinct advantage. A tight match on the track resulted in a 65-65 draw, Newcastle with Magee and Andy Dickinson unbeaten gave up a likely win by using the young Carson brothers in the "nommie". Hull were winners by that 13 point margin. A Craven 13, A Norrie 12, S Rhodes 11+3(5), H Middleton 11, D Johnson 10+3(5), L Smith 8+4. N Magee 16, A Dickinson 16, K Walker 12+1, N Carson 10, C Carson 6(5), D Carson 5(5). . The Manchester steamroller rolled into town and left beating a full strength Nome side by 23 points. It was one way traffic with only Parr and Kirkup managing a win. Les Bowden was unbeaten for Manchester, only Dave Kilroy not joining the party. J Watchman 19, L Bowden 18+2, S Davidson 14+1, D Salthouse 13(4), J Higham 12+1, L Phillips 11, M Hack 10(4), D Kiroy 4(3). In Division 2, Manchester used five of their first team again, basically making the match a losing cause. As expected they totally out classed Newcastle with five riders unbeaten, but after penalty points were taken into account, Newcastle took the league points. A Patterson 8+2, K Walker 8, G Stobbart 8, N Carson 7, C Carson 7(5), D Carson 7(5). D Salthouse 20(5), D Kilroy 16, M Hack 14+2, J Higham 14+2, L Phillips 12+4, D Hulton 9+1(5). After a bye in the first round, Newcastle had a home tie against Stockport in Scott Grant KO Cup. Unfortunately full details of this meeting are currently unavailable. However, Newcastle failed to progress, Stockport taking the win 94 -83. The following day Newcastle headed South to Sowerby Bridge, with the hope of getting a better result. However, their weekend didn't get better as the home side took a 19 point win. Top scorers were Parr and Wilson, who unfortunately came a cropper in the last heat, Sowerby Bridge capping their win with a 7-3. Guy Stobbart made his Division 1 debut, unfortunately not finishing in his only race. F Rothwell 18, P Dyson 17+2, R Machin 16+1, S Jones 11+2(4), Pl Mann 10+3, D Elam 10(4), T Hulton 9+2*3), N Johnson 8+1. G Parr 17, J Wilson 17, T Kirkup 15+1, J Keith 11, N Magee 8+1, K Walker 6, A Patterson 6, G Stobbart 0(1). A fine meeting was next up for the Division 2 points. Penalty points were given away by both teams, the home side starting with a 4 point advantage. Newcastle took an early lead, and by heat 8 were 7 points up. The home side fought back with two 6-4s. Ashie Patterson won heat 12 in a drawn heat. That left only the nominated heat left. Scores on the track were poised on a knife edge, as with the penalty points, the home side were just one point . Any sort of heat advantage would be enough for either side. The top four riders contested the race which was won by Newcastle's Kristian Walker followed by David Elam. 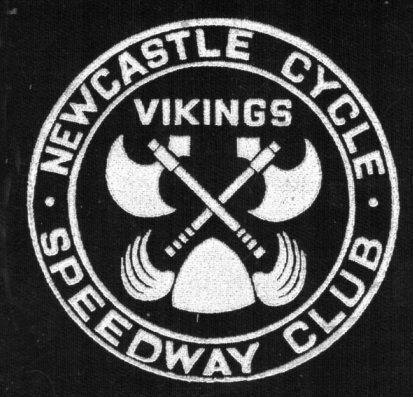 The vital third place was taken by Neil Magee, so Newcastle had won by the smallest margin 89-88. D Elam 16(5), T Hulton 15(5), J Brearley 11+1, I Johnson 8+3, M Jones 7+2, R Bough 5. K Walker 18(5), N Magee 18(5), A Patterson 15, D Carson 6, G Sobbart 5+1, C Carson 5. 15 July 1990 Newcastle sent their first team to Glasgow for a challenge match. It was an easy win 102-78. Unfortunately we only have the Newcastle scorers. This was probably the worst performance of the season. Birmingham were the visitors, and earlier in the season Newcastle returned from the Midlands with a big win. 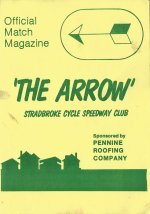 This looked to be a meeting where the team could return to winning ways, Birmingham's top six all reached double figures, Mervyn Cooper led the way dropping just one point to Gavin Parr. Jason Keith riding tactically at reserve was unbeaten, but surprisingly didn't take five rides, Birmingham were never behind, and comfortably took the match by eleven points. One to forget. G Parr 17, J Wilson 15, J Keith 14+2(4), T Kirkup 12, N Magee 7(3) ,K Walker 7, A Dickinson 6+1, P Marshall 5+1(4). M Cooper 17+2, B Prince 15+1, M Winwood 15+1, D Bullock 14+2, A James 13+3, M Lander 10+3, C Plummer 5(3), R Malkin 5(3). In Division 2 Birmingham rode with seven different riders, but were no match for the home side. Led by the unbeaten Ashie Patterson and well supported by Kristian Walker and a returning Paul Dickinson Newcastle won by 14 points on the track. Birmingham's top man was Lander with an excellent 19 points. K Walker 17+1(5), A Patterson 16, P Dickinson 15+2(5), N Carson 11+3, C Carson 7, D Carson 6. D Lander 19(5), M Elliman 12(5), C Winwood 10, P Jackson 7+2, J Addis 4+1(3), M Elliman 3+1(2), R Pilling 3(3). Oh dear! Without Gavin Parr, Newcastle failed totally against a strong Tameside side. Burke and Eaton each failed to finish once, gifting Newcastle points. In fact the only time a Rebel finished ahead of a home rider was when Jason Keith came second ahead of Unwin. R Farrell 19+1, M Hammersley 18+2, S Pearce 18+2, A Chadwick 17+3, L Unwin 14(4), B Eaton 13+3, G Dent 11+1(3), J Burke 9+3(4). J Keith 12, N Magee 9, T Kirkup 8, A Dickinson 7, J Wilson 6+1, K Walker 6+1, A Patterson 6(3), N Carson 4(3). In Division 2 Paul Dickinson, Neil Magee (unbeaten) and Kristian Walker with a superb 19 were on top form, but lacked support. Newcastle failed by just five points on the track, but gave away 16 penalty points. G Farrell 16(5), N Hickman 12+1, 73A Ratcliffe 11+1, A Smith 10+1, S Hammersley 9+2, I Graham 9+2(5). K Walker 18(5), N Magee 16, A Dickinson 14+1(5), C Carson 5, D Carson 4, G Stobbart 4. Newcastle returned to Manchester to face Stockport, and put up a much better display despite being on the losing side again. Gavin Parr was back to top the score chart with 18 points, and John Wilson backed up with 17. Stockport were eventual winners by twelve points, Andrew Jackson top scoring with 19 points. A Jackson 19, G Johnson 14+3, F Finnigan 14, D Cragg 13+1, K Garland 13+1, C Day 12+1, C Finnigan 6+1(3), C Davis 4+1(3). G Parr 18, J Wilson 17, T Kirkup 13+1, J Keith 11+2, N Magee 8+1, A Dickinson 7+1, A Patterson 7, G Stobbart 1(1). A lack of riders meant Newcastle went into the Division 2 match with six riders who had already ridden, in so doing the meeting was all but over before the start as Stockport started with a massive 62 point start. The meeting itself was entertaining with the Stockport reserves showing up well. On track, Newcastle won by 16 points. S Ward 15(5), B Wheatley 14, C Woods 12+2(5), M Tollett 7+1, S Busby 5, M Woods 4. N Magee 17+1(5), A Dickinson 16, G Parr 13+3, J Keith 12+1, G Stobbart 8(5), A Patterson 7+1. Another home defeat, this time Heckmondwike came away with the points. Led by unbeaten Martin Kent with strong support from Pat Beacock, the visitors took the lead in the first heat, and were comfortable winners by fourteen points. A 7-3 in the final race from Parr and Keith kept it respectable. Parr again was Newcastle's top man with 19, John Wilson was solid with 15. G Parr 19, J Wilson 15, P Marshall 12(4), T Kirkup 11(4), A Dickinson 8, J Keith 7+2, N Magee 7+1, K Walker 2(3). M Kent 20, P Beacock 16+2, S Blair 14, D Kent 13, S Carter 11+2, M Richardson 8, D Smith 7(3), D Wood 6(3). Unbeaten Smith and Robinson led Heckmondwike to victory in Division 2. Despite gaining 13 points from p/p, Newcastle went down by 11 points, Ashie Patterson was best with 14. A Patterson 14, P Dickinson 12, N Carson 12, CCarson 6(5), D Carson 5(5), G Stobbart 4. D Robinson 20(5), D Smith 15+1, D Wood 12+1, C Laydon 11+1, J Carter 10+2, A Buckley 9. Hull were the visitors, but unfortunately arrived with only six riders to cover both meetings. Newcastle themselves were without Terry Kirkup, Paul Marshall and Andy Dickinson. Although the Schofield brothers rode well for Hull, they were lacking in strength and forced in too many heats to have only three riders, Newcastle needing a morale boosting win seized their opportunity A makeshift side steamrollered on giving everyone a chance to boost their averages. Parr and Wilson were unbeaten and double figures were gained by everyone else. Craig Carson made his senior debut having a single ride. G Parr 20, J Wilson 19+1, J Keith 17+1, N Magee 15+1, N Carson 14+1, P Dickinson 13+1, A Patterson 10+1, C Carson 2(1). A Schofield 16, P Schofield 16, C Boot 11, A Norrie 9, D Johnson 6, M Barnes 6. The Division 2 meeting went down to the final heat. Hull using the same riders, gave away a massive 64 penalty points, while Newcastle also were penalised by 34 points. Newcastle therefore had a 28 point advantage. With just the nominated heat to go, the home side were ahead by 3 points. Hull sportingly refrained from using their top Division 1 riders, and a Neil Magee win gave the win for the home side. Steven Hunter made his Newcastle debut. N Magee 18(5), P Dickinson 12(5), C Carson 8, G Stobbart 6+1, D Carson 4, S Hunter 4. P Schofield 16, A Schofield 15+1, C Boot 15, A Norrie 14+2, D Johnson 9+2, M Barnes 8+1. 1990 had been a difficult year for Newcastle. Having to start with a different looking team, they were certainly weaker than previous year. A hammer blow was the transfer of Mick Parr to Heckmondwike after a handful of meetings. Successes were the improved form of Jason Keith, while Neil Magee, Kristian Walker and the Dickinson brothers helped make the Division 2 side a potent force. 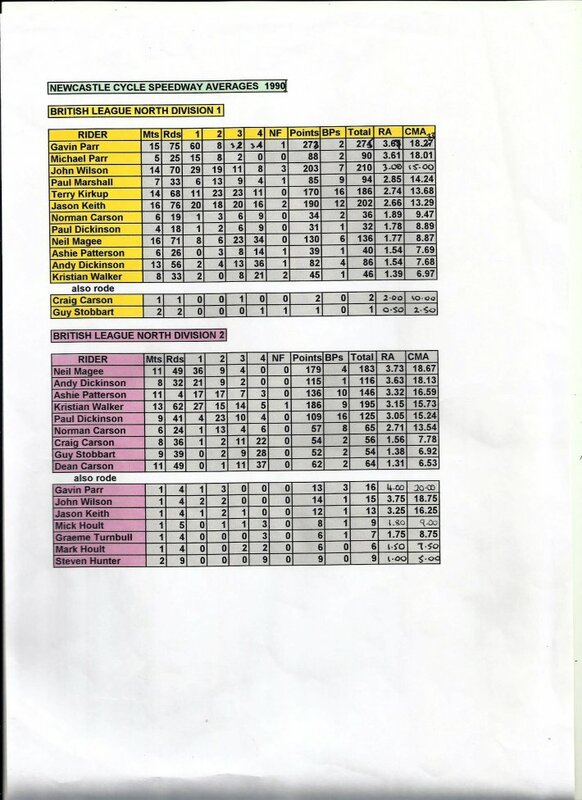 Gavin Parr was now one of the top riders in the league, only dropping 25 points all season. For the final league match of the season, Newcastle visited Sheffield. Despite the welcome return of Mick Parr for this meeting, Terry Kirkup and John Wilson were missing and Sheffield ran out easy winners, 100-79. Gavin Parr was again unbeaten, Sheffield apart from reserve Scott Marshall were solid, collecting a massive 13 bonus points. M Gamble 16+2, A Cumbers 16+1, P Shale 15+2, M Ashton 15, G Stringer 14+1(4), P Ashton 13+5, S Perkingon 9+2, S Marshall 2(2). G Parr 20, M Parr 17, J Keith 10, N Magee 9, P Dickinson 8, K Walker 6, A Dickinson 5+1(3), N Carson 4+1(3). In Division 2, Sheffield won on the track by 12 points, but forfeited 41 penalty points to Newcastle's 13. The league points therefore went to Newcastle. M Gamble 16, S Perkington 16, G Stringer 16, J Knight 10(5), S Marshall 8, M Ashton 5(5). K Walker 12, A Dickinson 12, P Dickinson 12, C Carson 10+2(5), D Carson 8+2(5), G Stobbart 5+1.